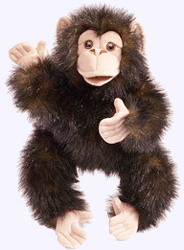 This adorable Baby Chimpanzee is a hug-able puppet that can be any child's best friend. 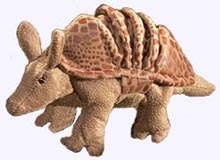 With a movable mouth and sweet expression, he is fun for playtime, naptime or taking him on the road as a travel buddy. Hand Puppet is 15" tall. 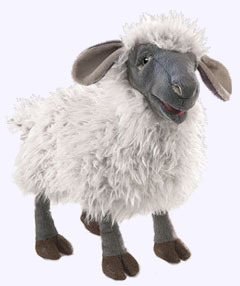 Yes, you "herd" right; this BLEATING SHEEP puppet has a sweet, comical face and soft, silvery fleece. 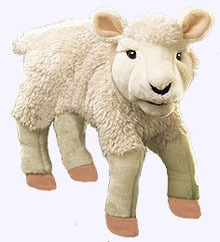 This is one puppet "ewe" will surely love. Animate her mouth as you gently squeeze her body to hear her bleat. Sheep is 13" long. Equipped with a realistic sounding grunter that activates with a squeeze of his pot belly, this cuddly little porker will have you rolling on the floor laughing! 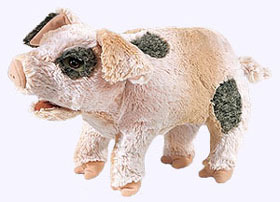 Delightful silky soft plush of pale pink with grey patches and a curly tail come to life with a workable snout, mouth and front trotters. Pig is 14" long. A perennial petting zoo and farm favorite, the good-natured goat is charming and sweet. 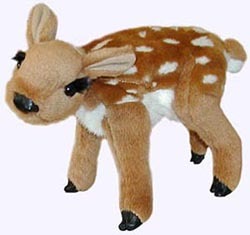 Folkmanis' 14", salt-and-pepper rendition has a sweet face; floppy ears; and soft, safe, molded horns. 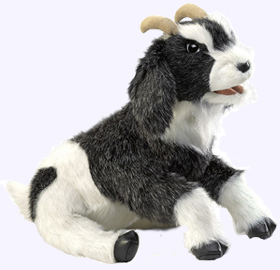 Weighted, vinyl hooves make playtime jumping and climbing - some of a goat's favorite activities - realistic and fun. The lamb has long been a symbol of youth and innocence. With a sweet face, workable mouth and ultra-soft, nubby fur, this Lamb puppet will tame the fiercest lion heart and bring the spirit of spring into any room. Hand enters from underneath. Lamb is 12" tall. 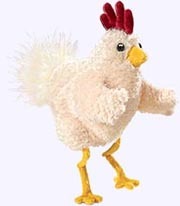 This groovy gal has feather soft plush, playful eyes and velvety comb atop her cute little head. Animate the head and wings to enliven this gregarious bird for pecking and flapping. Funky chicken is 9" long. 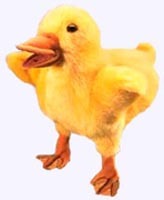 Duckling is designed so smaller hands can animate its bill and wings. Soft and cuddly duckling is 9" tall. 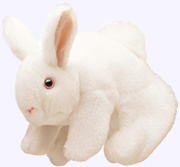 Running to his burrow or nibbling on the garden, the soft and timid 8" bunny rabbit is a favorite animal of young children. 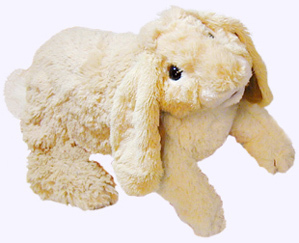 This Bunny Rabbit puppet is just the right size for cuddling, whether on or off the hand of Mom or Dad. Large as life and twice as cuddly, once you pick him up you won't want to put him down. 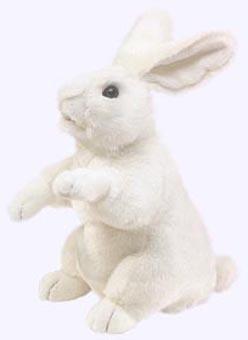 Standing White Rabbit puppet features movable front paws and mouth, stands 17" tall, is recommended for ages 3 and up. This adorable storytime pal is super soft. It sits alert with ears perked. 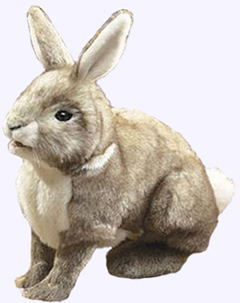 The front paws and mouth are moveable in this life-like rabbit. Hand Puppet is 14" long. A princess among kitties, this whimsical Fluffy Cat has a movable mouth with a realistic tongue to demand more kibbles. Her extra fluffy body and long luxurious tail are sure to elicit lots of laughs. 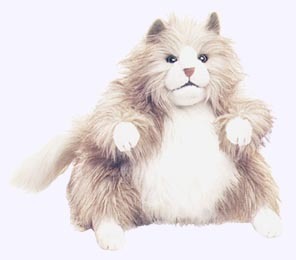 Fluffy Cat Puppet is 12" tall. Tabby Kitten is 8" of soft striped fur and wiggly whiskers. 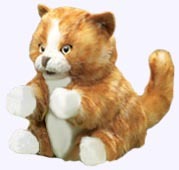 Animate the legs and head of this kitten puppet to make her pounce and preen. 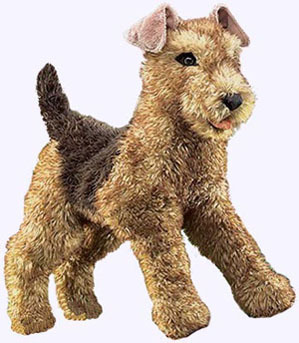 Known as the "King of Terriers" the new Airedale Terrier puppet is ranked with high marks for realism. Hard to distinguish from the genuine thing, this 20" puppet features the signature markings of the breed: wiry looking yet soft fur with black saddle and tan head, ears and legs as well as a black nose and dark, soulful eyes. 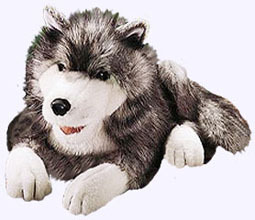 Cradle this cuddly canine in your arms to work his mouth while your other hand wiggles his playful tail. Clearly the best of show, this puppet pooch will soon become a lovable family member! 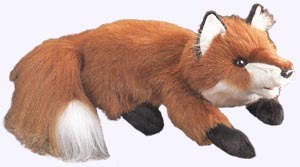 Realistic 15" long Red Fox Hand Puppet is a great companion for children of all ages as they enjoy stories about this sly little creature. 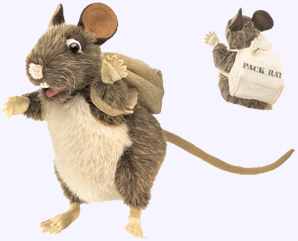 The White Rat puppet has an endearing quality that will charm most anyone. Give him a mini teddy bear to hug with his movable arms and watch his sweet, expressive face light up with joy! Puppet is 19" to end of tall. 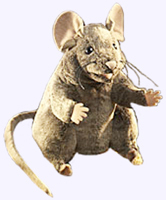 Even if you find the real thing creepy, this roly-poly Rat puppet will win you over. 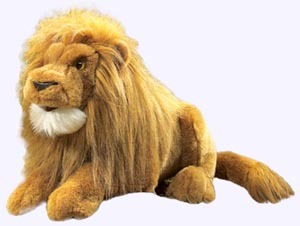 With soft fur, expressive eyes and a little twitchy nose and tail, he can be shy or bold, cautious or curious. With his detachable "Pack" he can collect to his heart's content. Puppet is 12" tall. 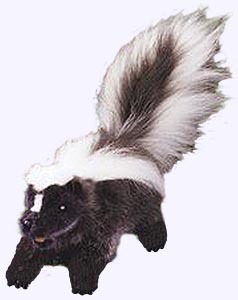 White stripes beautifully highlight the elegant sweep of long black fur on the hazardous hindquarters of this 14" skunk puppet. With a workable mouth and tail, she can be posed in attack position, but don't worry; scent glands are not included! Spanish for "little armored one" this 11" Armadillo puppet is a ball of fun! Featuring a "plated" shell fabric and leathered-looking skin, this extraordinary fellow is distinct in character. Animate all four legs as well as the head and when he's feeling shy roll him into his shell using the hook and loop fasteners. "What a handful of fun! Baby hedgehog puppet is super cuddly with ultra-soft fur and magnet closures for rolling into a ball. Slip your hand inside this 7" baby hedgehog to animate the head, mouth and arms and fall in love with your new pet! 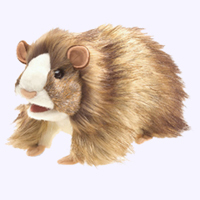 This plump 8" high and 6" wide Hedgehog puppet has places for all five digits, has a soft, short plush face and underbelly and a shaggier back and head. It can turn inside out to form the kind of ball a real hedgehog rolls into for protection from predators. He's a lean, scaly green eating machine! The giant Tyrannosaurus Rex continues to fascinate young and old alike, retaining his legendary status as King of the Dinos. 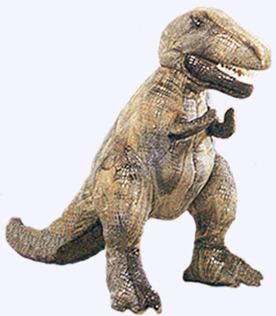 Animate his jaws and feel the raw power of the mighty T-Rex. He is 15 inches long. Nearly true to size, the Little Brown Bat flies in to spark your imagination. 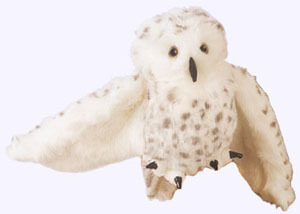 With a friendly face and furry body, kids will marvel at the wing membranes that stretch out an impressive 13" wingspan. Befriend this creature of the night and he just might rid you of the scourge of stinging insects. 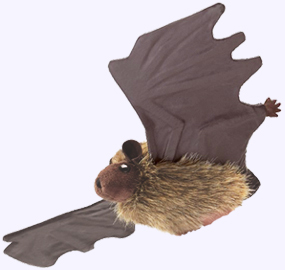 Brown Bat Puppet is 6" long. 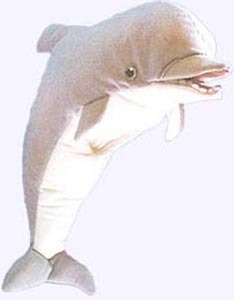 The playful dolphin arches its body to leap out of the waves. Use one hand to animate its grinning mouth, the other to flip the tail. This 16" puppet is sure to make a splash! Firebird Ballerina stuns audiences in a flaming red tutu. She is fully operational as a hand puppet with leg pockets for movement. 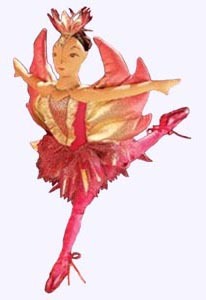 Firebird Ballerina stands 15" tall. This adorable rodent is the perfect size for storytelling. Soft and friendly with a moving mouth and paws and long velvety tail. Puppet is 8" tall.